Fan Favorites is an entertainment experience that everyone in your family will love! From lighthearted comedies to rousing adventures and gripping mysteries, Adventures in Odyssey audio dramas unleash your imagination. The stories are great for family car rides and provide conversation starters for parents. Adventures in Odyssey is fun, educational, and trusted biblical entertainment. Enjoy the best stories from the past thirty years, all in one package! This 30th birthday collection features 24 of the most best-loved Adventures in Odyssey audio dramas of all time, complete with a fan-created booklet. Your votes are in and your favorites are counted! 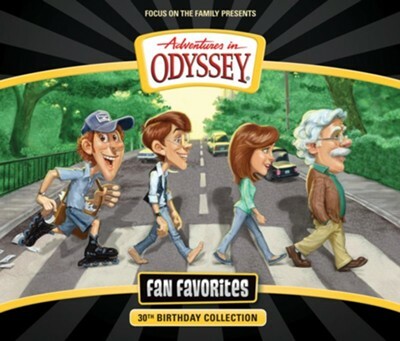 This 30th birthday collection features 24 of the most best-loved Adventures in Odyssey audio dramas of all time on 8 CDs, complete with a fan-created booklet. Its an Adventures in Odyssey fans must-have keepsake! I'm the author/artist and I want to review Adventures in Odyssey Fan Favorites CD.